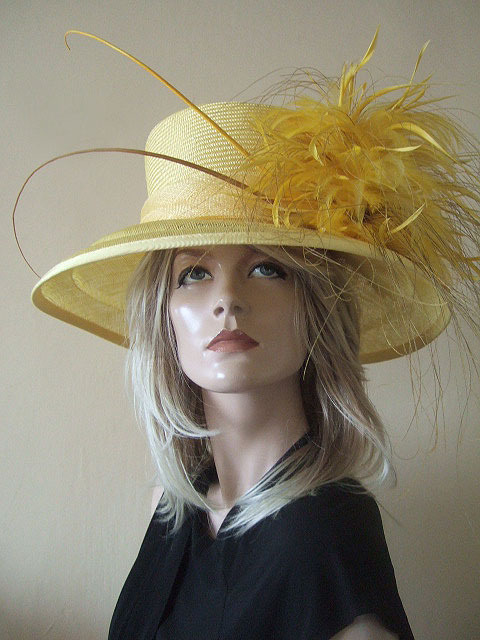 Beautiful Large Stepped Brim Hat in Primrose Yellow. Decorated with Plumes of Latte Ostrich and Peacock Hurl, and with Bright Yellow Hackle. Two Long Polished Ostrich Quills in Bright Yellow and Latte Brown Curling from the Arrangement and around the Crown. Brim is 5" Wide. Crown Height is 4.5"